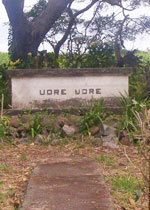 Udre Udre's grave on the outskirts of Vaileka town. The stones surrounding the grave signify the number of people he is believed to have eaten. As you turn off the Kings Road in to Vaileka in northern Viti Levu you come across a neatly-kept grave on your right, 12 kilometres before the town. The neatly-inscribed grave stone and serene surroundings belie the terror with the Fijian chief buried there held sway over the area more than 200 years ago. Ratu Udre Udre, a tribal chieftain in the area, was the last-known cannibal in Fiji and was known to practice this gruesome feat even after influential chiefs like Ratu Seru Cakobau ceded Fiji to Great Briatin and accepted Christianity. He is reputed to be the world's most prolific cannibal. During the 19th century, Ratu Udre Udre reportedly ate more than 99 people. He kept a stone for each body he ate, which were placed alongside his tomb in Rakiraki, in northern Viti Levu. According to Udre Udre's son, the chief would eat every part of his victims, preserving what he couldn't eat in one sitting for consumption later. While it is believed that Udre Udre ate over 9000 people, this would have been impossible considering the time it would have taken per person. Actual estimates from the count of grave stones near his grave the count near 872. The National Museum in Suva has on display part of Udre Udre’s dining table, with several of the actual ceremonial forks used by Fijians to eat human flesh. The excellent Lonely Planet guide to Fiji gives the following story. In 1849, some time after Ratu Udreudre's death, the Reverend Richard Lyth, who was staying in Cokova in north-eastern Viti Levu, saw a long line of stones placed together in a row. Each stone represented one of the chief's victims and amounted to a personal tally of at least 872 corpses, in addition to any eaten in his youth [apparently some of the stones had ben removed]. So next time you’re travelling that As you turn off the Kings Road in to Vaileka in northern Viti Levu you come across a neatly-kept grave on your right, 12 kilometres before the town. The Reverend recounted a conversation with Udre Udre's son Ravatu. “Ravatu assured me that his father eat all this number of human beings - he was wont to add a stone to the row for each one he received - they were victims killed in war he eat them all himself - he gave to none,” he said. 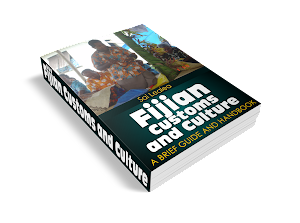 So next time you’re travelling that way take a little time to be acquainted with Fiji’s last cannibal.